ON THE SWELTERING morning of Nov. 26, 2016, Hélio Zampier Neto, a 31-year-old journeyman pro soccer player, awoke next to his wife, Simone, in the gritty agro-industrial city of Chapecó in Southern Brazil. In his mind rolled the remnants of a dream, images made fearsome by the thought of the coming hours. Soon Neto and his teammates on Chapecoense, the startling new force in the premier soccer nation’s premier league, would board a jet for the first flight of a five-day, three-nation trip—the most celebrated journey of their lives. Three days before, a heartstopping tie against the Pope’s team, San Lorenzo of Argentina, had propelled Chapecoense into the Copa Sudamericana finals and engulfed the city in what its mayor calls “an absurd feeling of euphoria.” In 43 years the Big Green had never sniffed a major Brazilian championship, much less competed for one of the continent’s most prestigious titles. But now the team’s 6′ 5″ starting central defender didn’t want to go. Simone would hear no more. She covered her ears, saying, “No, no, no,” and Neto dropped it until they had gotten up and washed and sat down with their nine-year-old twins for breakfast. When he tried again, Simone still wouldn’t listen. But Neto was scared. In his nightmare the plane crashed amid mountains and trees but he emerged, staggering from the wreckage. When he looked back, three other passengers were walking out too. Finally, Simone allowed him to speak of his nightmare: the plane plummeting to earth, the dozens of grisly corpses, the blood soaking every inch of his body. Sharing it—hearing Simone’s soothing words—allowed Neto to overcome his dread and ride the team bus to Chapecó’s airport, climb the stairs and board the jet for a Série A match the next day in São Paulo. He almost forgot the nightmare entirely when, on Monday, Nov. 28, Hélio and the rest of the team’s contingent—22 players; 21 journalists; 23 members of the team’s board, coaching and office staff; and two local boosters—got on a commercial flight to Santa Cruz de la Sierra, Bolivia, where they transferred to a chartered four-engine AVRO 146-RJ85 for its 1,848-mile leg to Medellín, Colombia. NETO TELLS HIMSELF THAT IF HE HAD REVEALED HIS DREAM TO HIS TEAMMATES, THAT THEY SHOULDN’T FLY TO THEIR BIGGEST GAME, NONE WOULD HAVE LISTENED. THEY WERE CONDEMNED. AND HE HAD BEEN CHARGED TO WITNESS. “I think God gave me a warning,” Neto says. To what end? Yes, LaMia Flight 2933 crashed, and he and five others onboard did survive. But 71 people—64 flying with Chape, and seven LaMia personnel—died that night. In the aftermath Neto kept praying, but nothing eased his guilt: for not relaying that warning to friends and colleagues, for not saving them all. Living with it was hell. So now he tells himself that if he had revealed his dream, told calloused pros that they shouldn’t fly to their biggest game, none would have listened. They were condemned. And he had been charged to witness. “It had to happen,” Neto says. AMONG THE first civilians to notice a problem above Medellín that night sat at home, 2,771 miles to the southeast, in Chapecó. 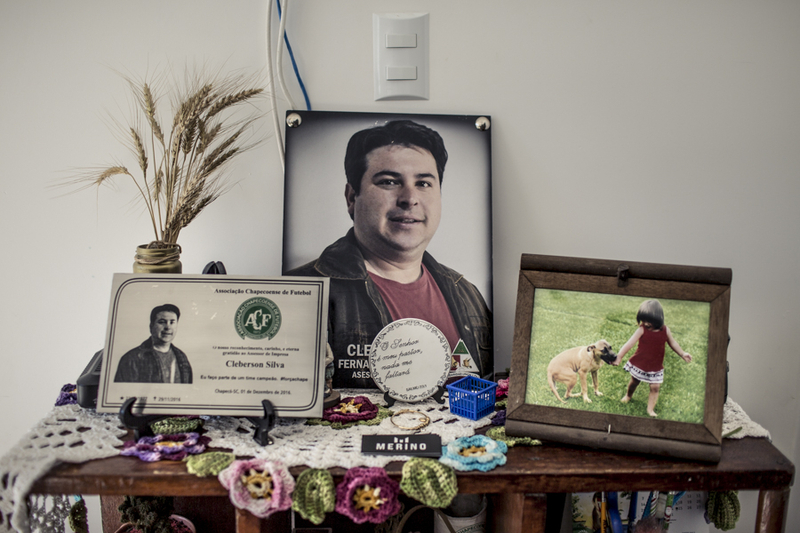 Gilberto dos Santos, a cofounder of Chapecoense’s 150-member fan club, Guerreiros do Verdão (Warriors of the Big Green), had been tracking LaMia Flight 2933 on his home computer for nearly five hours, then saw its radar-created avatar circle twice—and vanish. He called a friend. “The plane’s disappeared,” Dos Santos said. By then, the success of Chapecoense (SHA-puh-KO-en-say) had become a local obsession, if only because of the Big Green’s unprecedented rise, in just five years, from Brazil’s fourth division to Série A in 2014. And the team’s bond with Chapecó—at 209,553 residents, the smallest city in the 20-team top division—held an intimacy rare in a nation where soccer players are deified. Big Green starters could be seen all over town, shopping, sipping espresso, dropping kids at school. And all embraced the club’s management motto, which so matched the town’s plucky self-image: Do roupeiro ao presidente, somos todos iguais (From locker room attendant to president, we’re all equal). Indeed, Chape’s run to the Copa Sudamericana final, an away-and-home set against Colombian power Atlético Nacional, was one of those once-in-a-lifetime phenomena that shreds the usual bounds of fandom. With the Big Green’s emergence outstripping all ambition and budget, and their jubilance providing relief from endless tales of futebol corruption, they had become every Brazilian’s second favorite, a battered nation’s happy surprise. 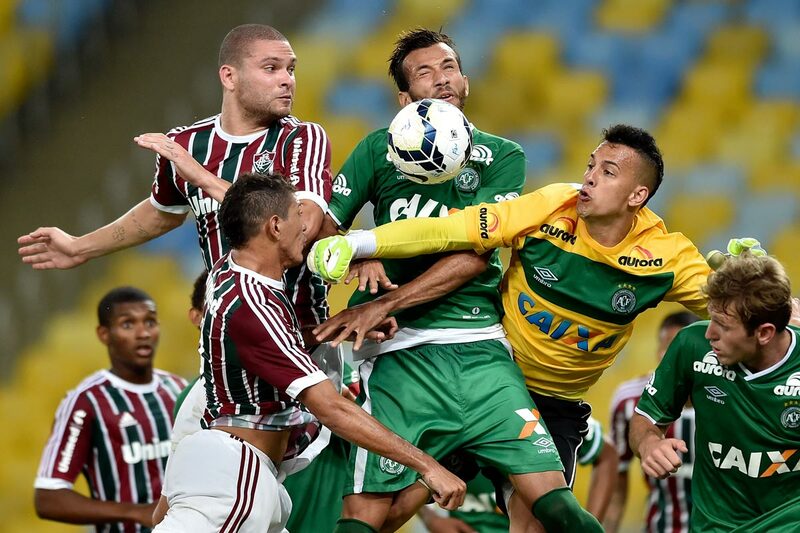 Chapecoense facing off against Fluminense during the Brasileirao Series A at Maracana Stadium on November 20, 2014. Founded in 1973, Chapecoense became a state power and gained an early two-year foothold in the Brasileirão, back when more than 90 teams diluted the top league. But even then it was run more as a social club than a business, and by the late ’90s, Chape nearly dissolved. The team languished until 2010, when civic and business leaders sparked a complete overhaul. Backed by a new board of directors, Sandro Pallaoro, head of a local food company, became president, instilled strict accounting practices and began paying down debt. And he persuaded Maringá, a former Big Green midfielder and childhood friend, to run the football department—for free. Knowing his team, with a budget one-third the size of powers like Corinthians or Palmeiras, could never compete financially, Pallaoro challenged the laissez-faire ethos of most lower-division teams. He shipped off partyers and malcontents, made sure wives and children felt part of day-to-day planning, and—most vitally—met payroll. As one player’s mother put it, “Chapecoense paid little, but they paid on time.” Within three years it had qualified for Série A. And not just in the standings. Its home stadium, the 22,660-seat Arena Condá, was antiquated; the players had no dedicated training site; Maringá still paid his own way. Then on May 25, 2014, the day Letícia gave birth to their first child, Lorenzo, Danilo made four saves and Chape broke through to beat Palmeiras 2–0. He had always wanted a son. 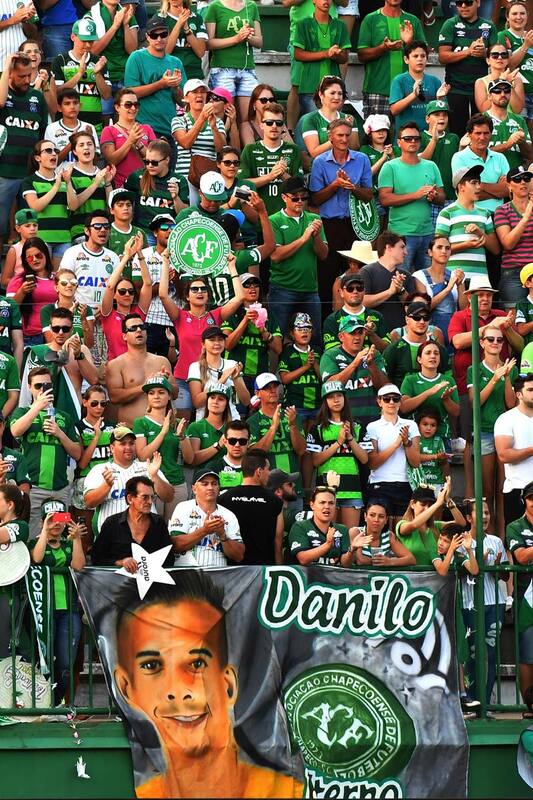 Chapecoense supporters hold up a sign of Danilo during a friendly match against Palmeiras on January 21, 2017. And that was before Chape’s run to the Copa Sudamerica final. In the round of 16, his six saves—including two astonishing lunges during the penalty shootout—sealed an upset of Argentina’s Independiente. After anchoring Chape’s stifling defense in two quarterfinal games against Colombia’s Junior de Barranquilla, on Nov. 23, Danilo sealed his legend. With the match scoreless and San Lorenzo needing a goal to advance, Danilo booted away one last furious rocket in the 93rd minute. Arena Condá ignited. A few minutes later, Fox Sports reporter Victorino Chermont interviewed Danilo, and replayed for him the clip with the call. What’d they say, Mom? Danilo’s glowing face, Chermont’s joy in staging a perfect TV moment, Pascovicci’s frenzied voice making them grin even wider: It was a portrait of delight. Within a week, all three were gone. NETO HAS no memory of impact. He doesn’t recall lying, caked in mud, for six hours amid the rain and shredded fuselage, or staring, eyes wide open, when a lone policeman discovered him. But the moment in the air, just before? The Bolivia-based LaMia first tried to fly Chapecoense, which had lost its game on Sunday to Palmeiras in São Paulo, directly from there to Colombia on Nov. 28. But Brazilian air regulations allow only a Brazilian or Colombian charter company to make such a flight, so the team instead flew commercially to meet Flight 2933 at Viru Viru International Airport in Santa Cruz de la Sierra, Bolivia. The original flight plan from there to Medellín listed a fuel stop in Cobija, Bolivia—negated, according to the Daily Mail, when a player’s request to retrieve a video game from his checked baggage delayed takeoff by 20 minutes, preventing Flight 2933 from reaching Cobija’s airport before it closed. At 5:18 p.m., Medellín time, the jet’s wheels left the ground. A plane crash is a near universal fear, even though the odds against experiencing one are famously minuscule; no major U.S. airliner has crashed since 2009. Yet folks don’t cross themselves in the back of a minivan. Some of this, to laymen, arises from the complexities of just getting a jet off the ground; when an accident is blamed on mechanical failure, the public barely grasps the terminology, let alone the cause. Nobody expects a crash because of something so simple, or horrifying, as running out of gas. Yet every inquiry into the crash of Flight 2933 points to the same cause: The plane exhausted its fuel supply 11 miles short of the runway because the Bolivian pilot, Miguel Quiroga, had decided against a refueling stop. He took off with a scheduled flight time of four hours and 22 minutes—and exactly four hours and 22 minutes’ worth of gas. International standards call for 30 to 45 minutes’ worth of extra fuel in case of weather-caused slowdowns or diversion to another airport. Reportedly, a revised flight plan—filed by LaMia once it became clear that the Cobija airport would be closed—included a stop in Bogotá. So far, no recovered cockpit recording or communication with ground control has revealed why that didn’t occur. EVERY INQUIRY INTO THE CRASH OF FLIGHT 2933 POINTS TO THE SAME CAUSE: THE PLANE EXHAUSTED ITS FUEL SUPPLY 11 MILES SHORT OF THE RUNWAY BECAUSE THE PILOT HAD DECIDED AGAINST A REFUELING STOP. At 9:53, with the craft at 18,000 feet, two of its four engines began to sputter. Neto jerked awake. He glanced at his wristwatch and thought, We’re about to land in Medellín…. And then the oddest thing: For the next three minutes the cabin was the opposite of what we imagine when hearing the word disaster. There was no shouting or panic. There was no announcement from the cockpit, though Bolivian flight attendant Erwin Tumiri, one of the six survivors, reportedly claims to have told passengers to buckle their seat belts as if for a normal landing. Then emergency lights flashed along the aisle. Neto began to pray. By now most of the passengers were awake. This isn’t possible, he thought, his dream coming true. There’s no way this is happening right now. This is a movie. Rescuers carry one of the survivors away from the crash site. At 9:58 p.m., Flight 2933 slammed into the crest of Cerro Gordo (Fat Hill) at 8,500 feet. The fuselage split in two. None of the six survivors recall that moment. Backup goalkeeper Jakson Follmann, who lost part of his right leg, shares some of Neto’s precrash impressions, and Ruschel’s last memory is from just after boarding, when Follmann motioned him over to sit by him. He and Follmann, along with radio reporter Rafael Henzel, were the first of the Chapecoense delegation to be found alive. Of the LaMia crew, only Tumiri and flight attendant Ximena Suárez survived. Neto was the last pulled alive from the wreckage, with severe injuries to the head, thorax, lungs and knees. His jaw was clenched so fiercely, against the pain, that all his back teeth were broken. Alan Ruschel (right) being loaded on an plane headed toward Brazil. And Neto said yes, and began to repeat it—but the doctor interrupted. Once that sunk in, Neto began naming his close friends on the team. “He’s not with us,” the doctor said. Neto started crying. “He’s not with us,” the doctor said. “He’s not with us,” the doctor said. But Neto kept asking. For two more hours he cried. IN HOMES across Brazil, the hours after the chaos on Cerro Gordo brought fear, horror and, especially, heart-crushing confusion. First reports out of Medellín announced two dozen survivors, followed by a statement citing 20 deaths, followed by long stretches of silence. But Danilo’s fate changed seemingly by the minute: Early reports had him dead, then the Red Cross announced that he was alive; then a report, wrongly, had him fighting for his life only to die in a hospital. 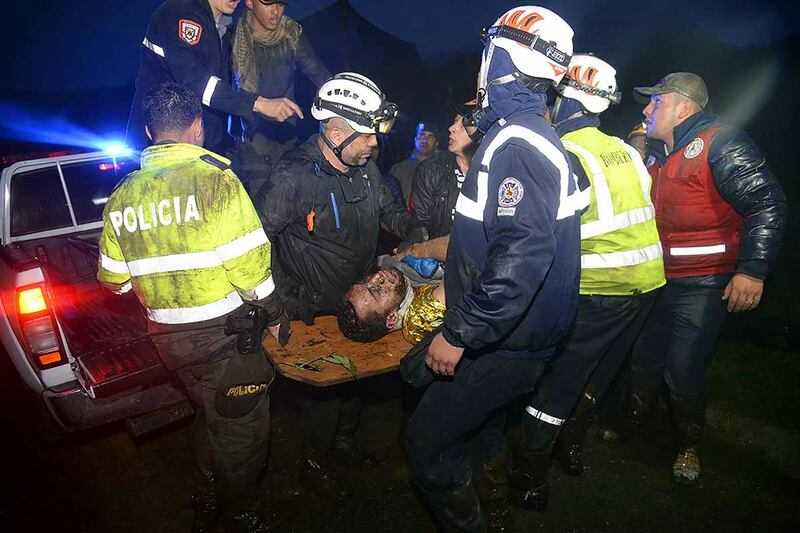 His wife on a cot at Arena Condá, his parents and sister in Cianorte: All waited nearly 15 hours for definite word. Then at 3 p.m., in Cianorte, the phone rang. Ilaides answered to hear a woman’s voice, from Colombia. Without preamble, the woman listed to Danilo’s mother three tattoos on a victim’s body: a cross on the neck; L-O-R-E-N-Z-O on the right forearm; a man and a boy walking together, on the right calf. Ilaides confirmed that her son had all those. But the caller had hung up. So she knew. By then, news of the disaster had gone worldwide. The crash thrust hundreds of families into the extremes of grief, rage, loss and depression, all experiencing in public the violent death of spouses and children and parents, the pitiless blasting of their happiness. How does the human mind absorb a collision with the worst it can imagine? It’s a question reserved not just for the survivors. 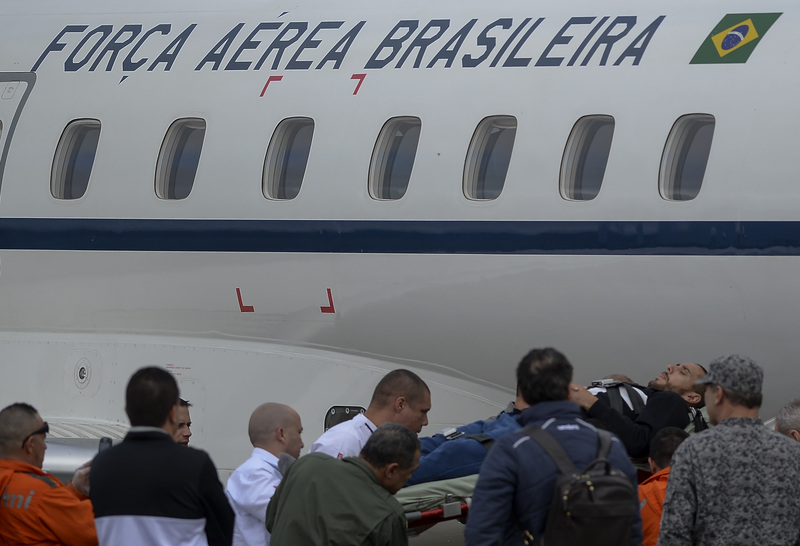 It preys, too, on the near-misses such as Chapecó mayor Luciano Buligon and current team president Plinio David de Nes Filho and Matheus Saroli, the head coach’s son—all of whom were supposed to be on the fatal flight. A misplaced passport saved Saroli. Important meetings in São Paulo saved Buligon and De Nes Filho, both of whom had been close to the team for decades. On came footage from last October, the cabin on the way home from the Copa Sudamericana match in Barranquilla: Players and coaches and directors smiling, singing, dancing; the red-eyed mayor thanking them all, saying how proud and happy they’ve made the city. “And that’s after a game we lost,” Buligon says. When he learned about the crash that first night in São Paulo, Buligon fell back in shock on his hotel bed. The next day he led the Chapecó delegation—six doctors and a lawyer—when it flew through a storm to Medellín, where a crisis office had been set up at the airport. The week became a blur: visiting hospitals, gathering each victim’s personal documents, issuing death certificates. But the worst was the morgue. For two days the mayor had to identify the shattered bodies, all the faces of the dead. By the time, late on Dec. 1, that the final 10 were confirmed, he was fully broken. By then, Danilo’s mother had made the trip from Cianorte to Chapecó. 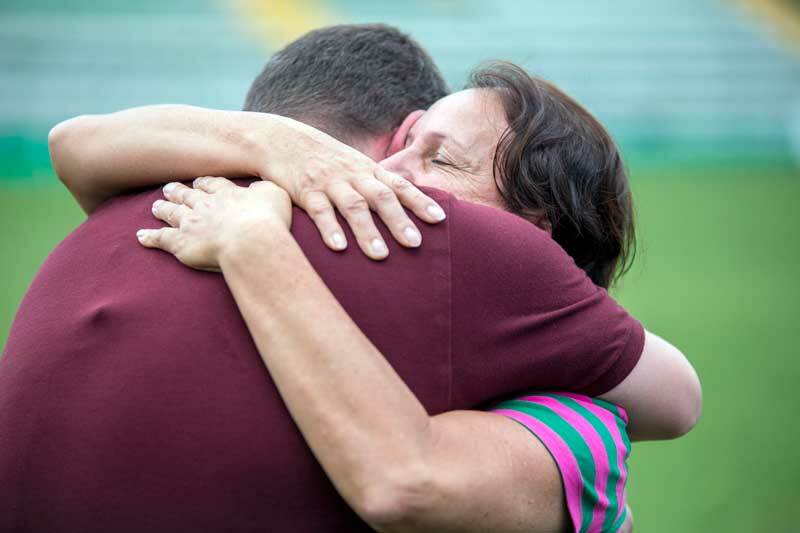 Fans had been sleeping outside the stadium for days already, grieving and “waiting,” as Ilaides says, “for their idols to arrive.” She told her husband, Eunício, “Our place is with them,” and the next morning they went to Arena Condá and she hugged everyone she could. But while explaining this a day later on live TV to reporter Guido Nunes, she abruptly changed the subject. As the cameras whirred Nunes took a step and sagged, sobbing, into her arms. Once the clip went viral, the feisty woman from Cianorte became the tragedy’s Mother Courage, a symbol of strength known simply as Dona Ilaides. But, she admits, comforting others was the only way she could cope. Dona Ilaides (right) embraces reporter Guido Nunes, who lost friends and colleagues aboard Flight 2933. In December, Bolivia’s defense minister declared that “what happened in Medellín was murder.” LaMia’s CEO, Gustavo Vargas, and his son Gustavo Vargas Villegas—a top official with Bolivia’s civil air authority who in 2014 granted the company its license—were arrested, and an air traffic controller who claimed to have raised red flags about the flight beforehand had left the country. After Colombia aviation officials issued a preliminary report dismissing mechanical failure, the country’s secretary for air safety condemned the airline and Bolivian air officials for approving an “unacceptable” flight plan. Those responsible, in other words, seemingly include a handful on the ground; in April, the elder Vargas briefly offered to plead guilty to manslaughter, and has since been placed under house arrest pending trial. The fact that Quiroga, the deceased pilot, was also the airline’s co-owner might well indicate an ongoing tension between safety and profit margins. Univision reported that in the six months before the crash, the ill-fated LaMia plane had run dangerously close to exhausting its fuel supply on eight occasions—including a flight carrying Argentina’s national team. Civil suits and more criminal charges would surprise no one. Questions linger about the role of the Bolivian political establishment; Vargas, the LaMia CEO, has high-level ties to the government. You can dismiss this as so much fan juju—or another glimpse of the human mind assigning order to chaos—but know that it helped, some, when the news broke that Flight 2933 had crashed. Of course it was raining that awful night in Medellín. Of course it rained far harder a week later, when 100,000 mourners filled the stadium and the blocks surrounding, and pallbearers carried in 50 caskets. And of course it rained the night of May 23, when Chape—down 1–0 to Venezuela’s Zulia and needing a win to qualify for this year’s Copa Sudamericana—scored with a second left in regulation and again, 64 seconds into extra time, to win and stay alive. Chapecoense’s Reinaldo Manoel da Silva celebrates after scoring a goal against Venezuela’s Zulia on March 7, 2017.
Who would know better? For many widows and family members, it’s unbearable to watch any futebol now, let alone Chapecoense games. But Freitas, a former photographer for the local newspaper Diário Catarinense, was snapping away in black rain boots right behind the goal for both Big Green strikes, before rushing inside to set up interviews. Her husband of 14 years, Cleberson Silva, ran the team’s press operation before dying in the plane crash. When, a week later, she went to the stadium to pick up his wallet and passport, De Nes Filho, the new president, offered Freitas her husband’s job. The media, not to mention other widows, were flooding the place. Sirli Freitas (center) embraces her two children Pedro (left) and Mariana. She wasn’t the only one: With Cleberson, Freitas had two kids, a nine-year-old boy and three-year-old girl. The family had just built and moved into their dream home, modern and full of light. “Not having time to be thinking, crying—it helps,” Freitas says. “And there’s nothing else to do: I have to go on.” Unlike the players, whose contracts ensured 40 months of salary in case of accident, Chape staffers had no coverage for workplace fatality. Freitas had been freelancing the previous year. She needed the money. But first, the rebuilding. 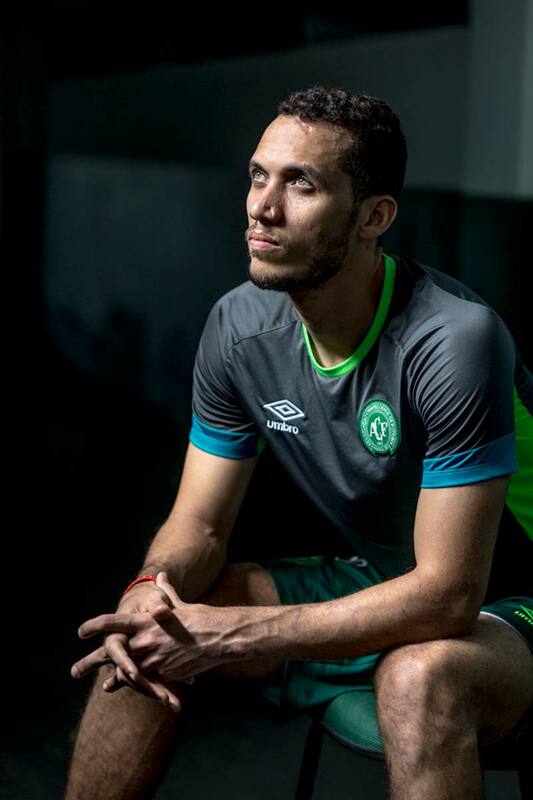 Chapecoense had five weeks to sign 20 players, a coach, assistants, a doctor, massage therapist, physiologist, equipment manager—the entire staff of a top-flight pro soccer team. De Nes Filho brought in an outsider, former Grêmio GM Rui Costa, as the team’s executive director and persuaded the 53-year-old Maringá, who left the club in 2015, to direct futebol operations. This time he wouldn’t be working for his boyhood friend. Pallaoro had been on Flight 2933. People pay tribute to those that were killed in the crash. Yet that wasn’t Maringá’s only grievous loss that day. Early on the morning of Nov. 28, while the team was readying to leave São Paulo, his wife of 28 years, Graziela, died of pancreatic cancer. She had suffered for eight months, with Maringá swearing off work to tend to his high school sweetheart, the mother of his two sons. One reason is because his charge went beyond just filling a roster. Other Brazilian clubs generously loaned players to Chape, and many with choices warmed to the challenge. When his agent called with offers from four teams and mentioned Chapecoense first, striker Wellington Paulista said, “I don’t want to hear any others. 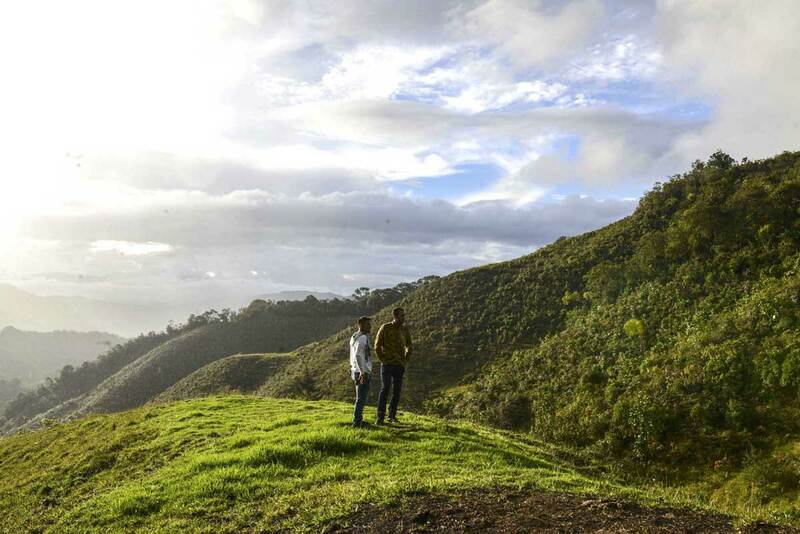 I want to go there.” And De Nes Filho and the new directors made it clear: We’re here to win—now. THROUGHOUT THIS SEASON ANY MOMENT OF VICTORY OR DISAPPOINTMENT OR PRIDE HAS COME LACED IN GLOOM, THE SENSE THAT ANY EMOTION CAN—AND WILL—INSTANTLY TURN TO TEARS. In the Big Green’s first game back, on a grim Jan. 21 at Arena Condá, the rebirth began with a 2–2 draw against Palmeiras. 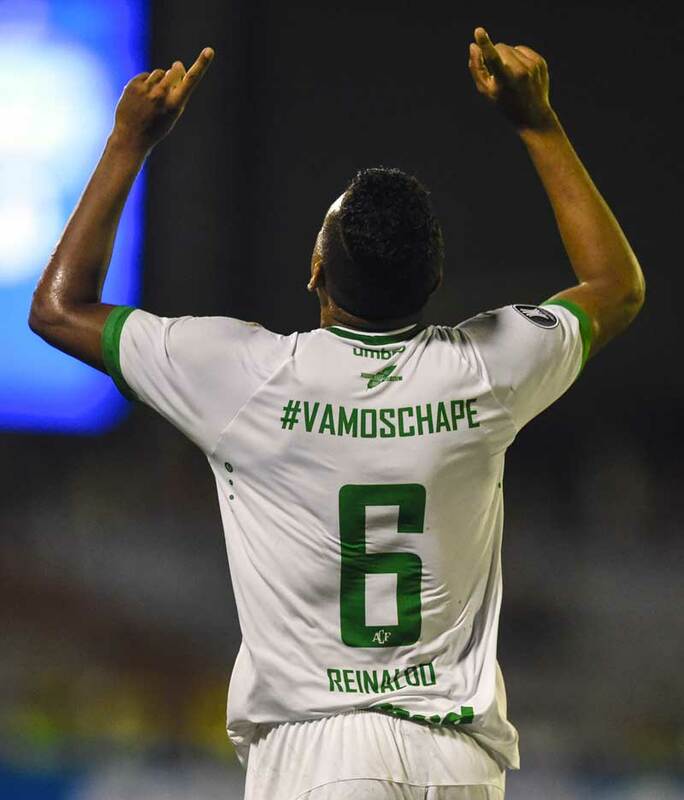 And early on, those sure that Chapecoense would struggle kept waiting: Chape won 18 games and held off Avaí in the final to indeed win its second straight state championship. Handed a first-time spot in the 2017 Copa Libertadores—when, postcrash, Atlético Nacional graciously ceded the ’16 Copa Sudamericana title—the Big Green upset Lanus in Argentina 2–1. “We are all stunned,” Paulista said in May. Eventually, though, the stress began to show. The win over Lanus was wiped out when CONMEBOL ruled that Chape wrongly allowed suspended defender Luiz Otávio, who scored the winning goal, to take the field. And after bolting out of the gate in May with three wins and a draw in Série A, Chapecosense slid precipitously toward relegation; in July, after five games without a win, the club fired coach Vagner Mancini. And, of course, throughout this season any moment of victory or disappointment or pride has come laced in gloom, the sense that any emotion can—and will—instantly turn to tears. Ruschel has made astonishing progress from spinal surgery and hopes to play in the Big Green’s August 7 friendly at FC Barcelona; Neto, with scars marring his nose, right ear, wrist and hairline, figures to take longer. Almost daily they are stopped by strangers, who ask for a hug—or, simply, start to cry. On May 9, the three surviving players and Henzel, the radio reporter, flew back with the team to Medellín for its Recopa Sudamericana set with Nacional. They visited hospitals to thank staff members and, jarringly, the crash site at Cerro Gordo. Of course it rained. Neto brought Simone and the twins. He felt that he had to see his dream, the gashed mountain, site of his salvation; Simone wept the whole time. “I wanted to go,” he says. For Freitas the trip was more a torment: One side of her, the journalist, wanting to see and know every detail, to learn if her husband died instantly or if he suffered. And then there was her work for Chape: Coldly lining up shots of the killing field, focusing and taking photographs, methodically hustling players to talk to the press. At times, she couldn’t help but look at those who lived and wonder: Why you? 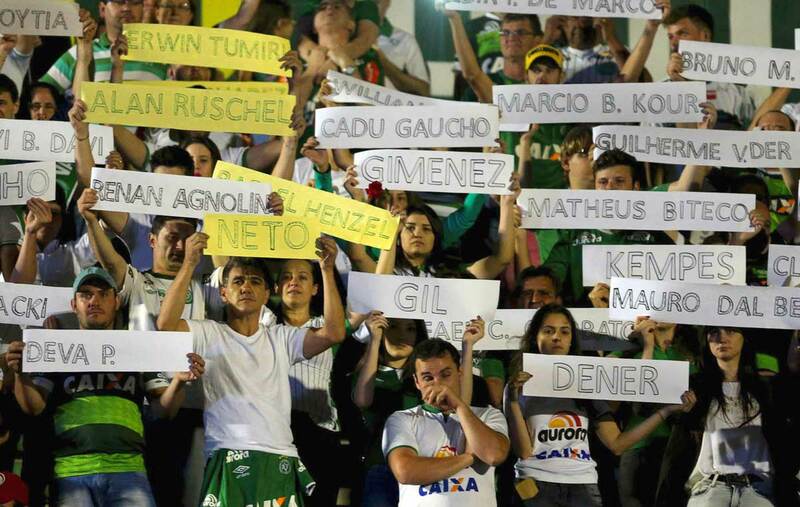 Chapecoense supporters hold up signs with the names of those onboard Flight 2933. There was but one serene moment, after the media rush: a climb through the mud, just a handful of team members, to the top of Cerro Gordo. The sun broke through, and a rainbow, and then Freitas stepped away from the rest and lowered her camera. For a few seconds, she didn’t dare move. Alan Ruschel (left) and Hélio Neto revisit the scene of the accident. As Freitas recalls this, she is sitting in the press room under Arena Condá. Behind her, on the wall, is a memorial photo of her dead husband, black-and-white; she snapped it years ago in their living room when Cleberson needed a portrait to go with a column he was writing. He never liked the shot, thought he appeared too chubby. From any angle, though, he’s looking straight at you. A memorial Sirli Freitas set up for her late husband Cleberson Silva. Hours later, Neto answers questions there too. The rest of the team has gone, and it’s dark outside; he is Freitas’s last responsibility for the day. Midway through, she walks in and sits next to him. Soon a sister who is helping her at home comes with Freitas’s kids—Pedro, who worshipped his dad and after the crash needed to count to 500 before he could answer any question, who now wants to study stars and learn about souls; and Mariana, who doesn’t believe that her daddy isn’t returning home, who sometimes refuses sleep until he comes to tell her a story. Neto goes on for a long time. Freitas sits staring at her phone: You can’t tell if she is listening. It is past dinnertime; her children are squirming, but the job isn’t finished. Neto speaks of his miracle, his gratitude, his broken teeth. Maybe sharing all this is therapeutic but maybe not, so you feel something heroic in the air, the space between him and her. She doesn’t look up until he is done. SUDDEN DEATH makes life a dream. Danilo’s 29-year-old widow, Letícia will tell you: She can spend hours hard-eyed and practical, knowing he’s dead, thinking of going back to school. Then there’s a trigger—a photo, a smell—and all reality blurs; she’s sure that the front door will open and he’ll burst in calling her name. Or she’ll wake up next to Lorenzo and in the morning quiet think, It’s not me who is living this. I’m dreaming. I’m not even here…. “Everything changed overnight,” Letícia says, tears streaming. “All the wives, everyone, had plans—to have another child, to build a house, to travel—with that person. And they were ripped from us. It wasn’t like a person being sick, you know? Everyone was good. Everyone was happy. And now in the night that person you loved, that you spoke to a few hours ago, is not there anymore. It is Sunday morning, May 28: six months to the day. Letícia is sitting at her dining room table in her hometown, Arapongas, in the eighth-floor apartment that she and Lorenzo moved into after the crash. Behind her on the flat-screen, the sports channel is broadcasting a memorial piece with footage of the caskets. Lorenzo, three years old now, wandered away just before the start. This is good: Letícia tries to shield him. She tells people not to cry when the boy is around. She tells him that his father is with Jesus now, but it backfires. “Why did Jesus do this to me?” Lorenzo asks. What can she say to this? What does the boy need? Nobody on the team felt closer to Danilo than Ruschel. The families barbecued together every weekend, and after the crash video surfaced of the two men grinning side by side on the leg from São Paulo to Santa Cruz, with Ruschel crowing, “We’re coming, Colombia!” Two weeks later, Letícia posted an Instagram message written in Lorenzo’s voice, topped by a photo of Danilo, Lorenzo and Ruschel hand-in-hand. Uncle Alan, it read. You came back, thank God. My mom and I are very happy with your return…. Soon I will give you that very tight hug … and you’ll be a little bit my father now. Do you promise to take care of me and my mom? Like in this photo, but now a little piece is missing…. (From left to right) Rafael Henzel, Helio Neto, Alan Ruschel and Jakson Follmann at Arena Conda stadium. A part of Letícia, and of all the wives and parents and families, froze the second they learned the news last November. That part will never understand a world that can—must—move on. 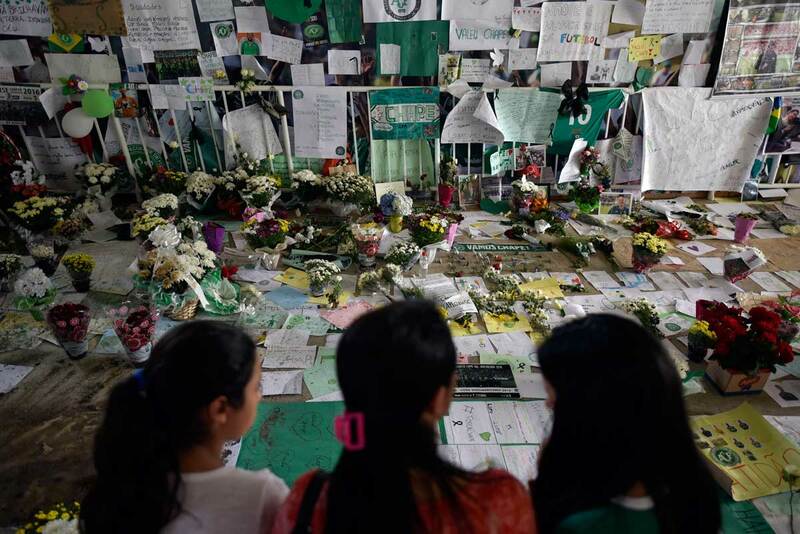 When, in April, Chapecó welcomed Atlético Nacional for the Recopa, fireworks exploded and people cheered and, to many widows, it all felt too much like a celebration. To them any step forward feels like forgetting, like a slap. Every win hailed as proof of Chapecoense’s “resurrection” leaves them stuck a little further behind. Sundays in Arapongas are quiet. The rest of the day stretches out before them, hours to fill. Lorenzo, playing with toy cars, suddenly loses interest, and of course there’s no knowing how a young mind might process all these questions, the crying, the strangers sitting in his dining room. But now he appears carrying a Chapecoense team photo. Lorenzo climbs up on a chair, lays the page on the table and points. “One day I’ll be the same as my dad,” he says. In the photo, the game has just ended. Danilo is standing in the middle of the back row, unsmiling for once. The conditions, of course, look overcast and damp. Then, just as quickly he quiets, whispers, “Papai,” and leans over to kiss his father’s face. Letícia and the strangers are sighing, Ohhhh, when Lorenzo stands back up. “Campeão!” the boy yells again, thrusting his arms to the sky. Then he begins to dance.